Charles Dwayne Stevens was born August 15, 1949, in Clarinda, Iowa the son of Byron Stevens and Eva (Hullinger) Stevens. 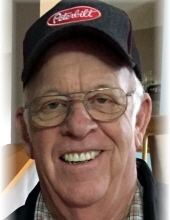 Dwayne passed away April 12, 2019, at the age of 69 at the Montgomery County Memorial Hospital. Dwayne grew up in Clarinda, Iowa, graduating from Clarinda High School with the Class of 1968. After graduation, Dwayne was united in marriage to Linda Whitehead on October 5, 1968, at the United Methodist Church in Clarinda. The couple moved to the New Market area where they were blessed with two daughters, Julie and Susan. Over the years, Dwayne worked for Morton Buildings, United Supplies, Keane Thummel and Schmitt Farms Trucking. They enjoyed traveling to watch their grandchildren in sporting events. Dwayne loved working outside in his workshop and mowing with his Ford tractor. Left to cherish Dwayne’s memory is his loving wife Linda Stevens of 50 years; daughters Julie Jennings and husband Brent of Osage, Iowa; and Susan Naylor and husband Mark of Groveland, Florida; grandchildren, Brittany Williamson; Brooke Clark and husband Tanner; Brady Jennings; Brock Jennings; Wyatt Naylor; Hanna Naylor; a great-grandson, Reed Clark; a brother, Robert Stevens of Clarinda, Iowa; sister-in-law, Linda Stevens of Paola, Kansas; a niece, Stacie Stevens; nephews, Danny Stevens and wife Jen; and Gary Stevens, Jr.; along with many other family members and friends. Preceding Dwayne in death are his parents Byron and Eva Stevens; brothers Gary and Lowell Stevens; sisters-in-law, Pat Stevens; in-laws, Milo (Mike) and Helen Whitehead; a grandson, Trevor Williamson; a niece, Sandra Stevens; and a nephew, Robbie Stevens. May he be at peace in God’s loving care. "Email Address" would like to share the life celebration of Dwayne Stevens. Click on the "link" to go to share a favorite memory or leave a condolence message for the family.